India is famous for the architecture of its temples. Meenakshi temple at Madurai, Brihadeeswar at Thanjavur, Tirupati Temple at Tirupati are just some of them. Even among these, the Dilwara Temples at Mount Abu, Rajasthan's only hill station are world renown for their stunning architecture and marble carvings. It is rightly said that the beauty of temples not only reflects the art and architecture of a country but also its spiritual evolution and prosperity of its people. So it is with Dilwara Temples that truly reflect the riches of the people of medieval Rajasthan and their knowledge of various art forms. Built between 11th and 13th centuries, the Dilwara temples are very well preserved. These are possibly the most well known Jain temples anywhere in the world and are an important Jain pilgrimage. There are five main temples in this complex. They are made in the Nagara style of temple architecture. The earliest temple of this group can be dated back to the same period as Brihadeeswar temple at Thanjavur in Tamilnadu. The temples are located in the midst of wooded hills and mango trees that give an unbelievable air of serenity to the entire complex. The luminous marble shimmers in the dappling sunlight and the detail of carvings on the walls, pillars and ceilings has to be seen to be believed. These are living temples; people perform puja here. There are facilities for pilgrims to bathe and get ready prior to offering prayers. There are five unique temples are named after the village in which they are situated. 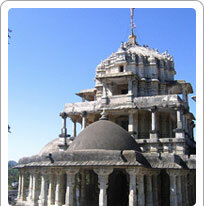 Vimal Vasahi (Shri Adi Nathji temple) is the main temple. Dedicated to the first Jain Tirthankar Lord Rishabh is made entirely of white marble. Built in 1021 by Vimal Shah, a minister of Bhimdev, the Maharaja of Gujarat, it stands in an open courtyard surrounded by a corridor. The corridor is resplendent with smaller idols of the Tirthankaras, carvings on pillars, arches, and 'mandaps'. The ceilings are also carved with designs of lotus-buds, petals, flowers and scenes from Jain and Hindu mythology. The central dome of the Rang mandap is breathtaking and this grand hall is supported by twelve decorated pillars. The plan of the temple resembles that of Kashmiri Sun temple at Martand. Luna Vashi (Shri Nemi Nathji temple): Also called the Tejpala temple, it is dedicated to the 22nd Jain Tirthankara Shri Neminathji. It was built in 1230 by two brothers, Vastupal and Tejpal. The Hathishala or elephant cell featuring ten beautiful marble elephants is stunning. There are nine ceilings, each more beautiful than the other. According to a local legend, before becoming the minister, the two brothers went on a pilgrimage carrying with them huge wealth that they decided to burry under a tree. While digging they found more gold. Anupama Devi, the wife of Tejapala then advised them to build temples at Satrunjaya and Girnar with their wealth. They heard about the holiness of Mount Abu and decided to build a temple there dedicated to Neminatha to commemorate their dead brother Luniga. It is believed that when the elaborate and intricate carvings were finished, Tejapala asked the carvers to add greater delicacy to the floral patterns by more chiselling, offering them reward in silver according to the weight of the marble filed. Later Tejapala he increased the reward by offering gold in weight of the marble if it could be chiselled further. While legends abound, without doubt it would have taken a good deal of encouragement to complete a monument of such beauty and refinement. Pittalhar Temple: Built by Bhima Shah, a minister of Sultan Begada of Ahmedabad, it has huge metal statue of first Jain Tirthankara Rishabha Dev (Adinath), cast in five metals. The main metal used is Brass (Pital) hence the name of the temple. The old idol was mutilated, hence it was replaced by the current idol in 1468-69 AD. It weighs four metric tons. Parshvanatha Temple: It is dedicated to the 23rd Jain Tirthankar Lord Parshvanath and was built by Mandlik and his family in 1458-59 AD. It has the tallest shrine in the entire complex. The outer walls of the sanctum are decorated with beautiful sculptures of Dikpals, Vidhyadevis, Yakshinis and Shalabhanjikas in grey sandstone. Mahavir Swami Temple: Smallest temple in the complex, it was built in 1582 and is dedicated to the 24th Tirthankara Lord Mahaveer. It has beautiful pictures painted on its ceiling by several artists from Sirohi.